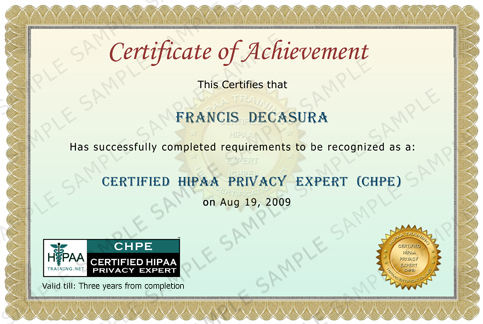 Certified HIPAA Privacy Expert (CHPE) is the HIPAA credentials which are focused on HIPAA privacy regulation and implementation of the privacy rule through policies, procedures and gap analysis. This certification is for the HIPAA privacy compliance team members who are seeking extensive & in-depth HIPAA training on privacy rule and next steps for HIPAA privacy compliance. There is NO prerequisite for taking this certification course; you can directly take this level without taking any other courses. We do encourage individuals interested in this credential to give us a call so that we can offer necessary guidance on the most appropriate course for their career objectives. We also recommend that if you are associated with the USA healthcare industry and have any of the following credentials, then consider taking this course as it will compliment your current credentials and will enhance your knowledge on how HIPAA affects your company. Send us an email if you want to recommend any other certifications. To understand how you can use the CHSE logo and certificate to help grow in your career, visit this page of How to use HIPAA logo and certificate to your benefit. You are tested after you complete the full online course. You need to pass the 39 questions test (3 questions per chapter, 5 minutes maximum per chapter to answer the questions) with 70% to receive the HIPAA certification of Certified HIPAA Privacy Expert (CHPE). This test is for 1 hour 5 minutes. You get 5 minutes per chapter to answer three questions from each chapter. Once you start the test you cannot stop it. This is a time bound online test. You can take the test from anywhere and at any time. There is no need to schedule for the test. Once you start the test, you need to finish it in allotted time. If you need the timeline allotted per chapter then the test will stop right there. Once you pass your test you can print out your certification immediately but if you do fail you will have to pay $150 to retake CHPE test. Once a year all students will have to go through one hour of update course which will include relevant regulation changes and other OCR/HHS activities on compliance and enforcement. To maintain your certification, you will continue taking update courses when they are released. You will receive a new certificate when your certificate will expire if you have taken all required update courses. You will NOT be required to take any test if you have taken the update courses regularly. Students can buy CE credits certificate for this course at the time of registration. You will receive 15 CE credits for this course through Approved Provider of California Board of Registered Nursing after completing the course.